We’re glad to announce a new partnership with UnbiasedAuto personal car buying service (https://www.unbiasedauto.com). They’ve earned a strong reputation for their services by making car buying cheaper and easier than ever. Their success begins with a passionate and talented team working together to deliver their vision. We’re happy to count their specialists among our ranks and look forward to a beneficial partnership. We’re excited to continue our growth into the fall and hope autumn finds you all well. Even though it seems like our Initial Coin Offering (ICO) was just last week, we have months of growth under our belts since. We’re excited to announce another week of development with the end of summer and more opportunities on the horizon and we’re as grateful as ever to have the support of a wonderful community. We’re delighted to announce another thrilling partnership with TrustedCars Flex (https://www.trustedcars.com/), continuing our mission to join forces with likeminded companies disrupting the automotive industry. TrustedCars Flex introduces a new paradigm of car usage by offering an all-inclusive weekly payment to access available inventory at participating car dealerships. Sign up on the app, pick your car, drive it for as long as you want or swap it for another at any time—all while avoiding the need for long-term contracts and fixed costs. They utilize Ethereum blockchain to power their token, ensuring payments are secure and verifiable. We’re excited to share our 20th weekly update and are grateful to have the opportunity to engage with our supportive community. Our partnerships continue to expand while our talented team is hard at work to propel our growth across the United States. We’re committed to our vision of disrupting the automotive industry and each week grow closer to our goal, onward and upward! It’s our favorite time of the week again already, when we get to share our progress with our stellar community. We’ve been focused on the development of our website and the system itself and have exciting updates in the works. Thanks to the support of our community our journey is sure to be successful. We’re grateful for the opportunity to share another week of progress with our supportive community. We have several projects in the pipeline and development on our current projects is moving forward at a meteoric pace. Our audience is hungry for the future and we are ensuring each of the products we offer is in their best possible form as we move forward. We’re excited to share another week of progress with you all. We’ve been focused on bringing our content up to speed to match our development and perfecting our offerings behind the scenes. While we love sharing headline-worthy updates with you, the subtleties of our business are just as vital to our success. This week we’ll be highlighting a few features some of our audience may not be aware of. We’re elated to announce that we have teamed up with Zeus Protocol. While all of our partners are incredibly valuable in their own right, most are focused around increasing the size of our data network. Joining forces with Zeus Protocol provides the unique ability to enhance our network by supplying context for our vehicle data through utilization of their analytics platform. We are happy to inform you that we’re taking part in the influential Crypto Games Conference (https://cryptogames.events) in Minsk, Belarus, on the 17th and 18th of October. The aim of the summit is to explore and display emerging technologies and tech hubs, all while uniting the worlds of games, blockchain, cryptocurrencies and other cutting-edge technologies. Our Belarusian team will be in attendance and we would love for you to meet us, ask questions and get to know everything about VINchain. Technology is changing the world around us at a rapid rate. This is causing industries like the automotive industry to evolve, especially for dealers, who are faced with changing customer needs and increased expectations. However, for those dealers who are ready and able to evolve with the times, this technological revolution presents immense growth opportunities. In the current Information Age, data is everything. Dealerships rely on data to guide functions from marketing to point-of-sale transactions, to servicing vehicles. Big data has also changed consumer behavior and expectations from their vehicles and dealerships. Consumers expect their vehicles to tell them when something is wrong, what is wrong, and when it is time for a service. They expect smartphone apps to find a nearby service center, book an appointment, remind them of the appointment, and provide the service center with a run-down of potential problems. They want connected vehicles, and connected service centers or dealerships. Big data makes this possible. A vehicle’s VIN (vehicle identification number) provides a lot of data about a vehicle, like manufacturer, the factory in which the car was built, model, body type, engine serial number, and when the car was made. The VIN number is linked to all sorts of information provided by sources such as insurance companies and government agencies like the US Department of Motor Vehicles (DMV). A vehicle’s VIN gives access to information such as repairs, mileage, service history, and whether the car had been in an accident, making a car’s VIN extremely important in the connected car economy. A blockchain is places data into ‘blocks’. Each block, or sets of information, is represented by a number, called a hash value, or digital fingerprint. The blocks are cryptographically linked, with each block containing the hash from the previous block, as well as a timestamp. This chain of blocks (blockchain) provides a robust and secure way to store data, as it generally resistant to data being modified. While security is a big feature for dealers, one of the main advantages of using VINchain’s blockchain app is the ability to quickly and easily access data pooled from many different sources. Dealers can also upload data, such as vehicle service data, directly to the blockchain without going through a middleman. When adding information, the dealer will be rewarded fairly, which in turn will allow cheaper access to vehicle history information. As dealers and other sources continue to add data to the blockchain, it grows into the most in-depth resource of vehicle history available. 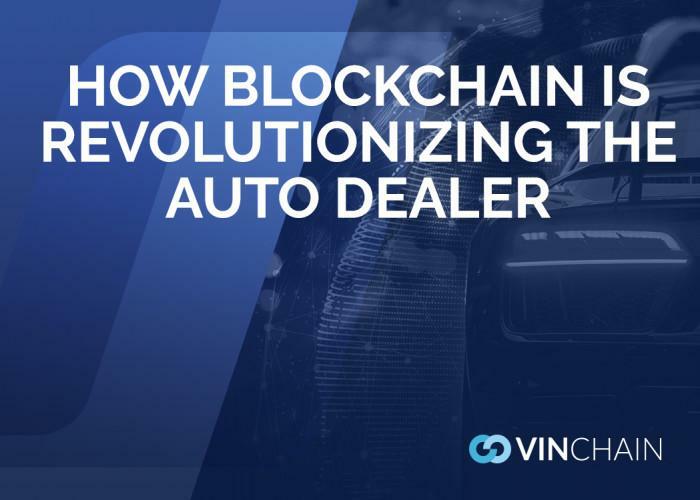 VINchain offers a dealership app and onboard diagnostics device, or OBD, that is customized according to the dealership or customer’s exact needs. The OBD is installed in a vehicle and provides real-time diagnostic feedback of everything that’s going on in the car, from wear condition of parts to engine performance and fuel economy. The data is communicated directly to the app, eliminating the need for things like emails, phone calls or text messages. The app allows dealerships to monitor vehicles and offer reminders about upcoming services and recommendations. The device offers geolocation and roadside assistance services, as well as remote control of the vehicle in certain situations. Dealers can also reach out to drivers to request data and make offers, which drivers can provide at their own discretion. Every time a driver or client provides information, they are rewarded, and the database of information gets expanded. ARE WE READY FOR THE CONNECTED CAR ECONOMY? The short answer is, yes. An estimated 90% of Americans live in a household with at least one smart device, with 60% of these users using their smart device to interact with automotive customer experience. These numbers are growing every year, making it increasingly important for dealerships. Despite this high interaction, and app expectations, very few vehicle owners actually use apps and websites to make appointments. This presents a major opportunity for dealerships — taking customers from interested to interacting, from interest to sale. VINchain’s rewards system is an incentive for customers to not only use their smart devices, but also make contributions to the car history database, which will ultimately serve them in the long run. We’re extremely happy to announce that VINchain will be listed on the IDCM ( https://www.idcm.io/ ) exchange on the 9th of November! We know that many of you have been patiently waiting for us to get listed on another exchange. As we noted in our previous article, IDCM covers more than 60 countries and regions across the world while holding the title of the first exchange alliance built upon a node consensus mechanism. IDCM counts itself among the top 20 cryptocurrency exchanges by trade volume. You can find out more about IDCM at: (https://coinmarketcap.com/exchanges/idcm/). VIN tokens (VIN) will continue to be available on IDAX. We remain focused on the development of our project and the courting of valuable partnerships; stay up to date for more exciting announcements.